Tom Clancy's Ghost Recon: Advanced Warfighter takes the series to the next level with a number of innovative features that should make this the most immersive and deep squad-based shooter to date. The biggest improvement this time is the new Cross Com system which will let players interact with other soldiers in real-time while on the battlefield. Another major enhancement will allow players to control drones and call in air-strikes on the battlefield. Visually, Ghost Recon 3 looks to set a new benchmark, with smooth, highly polished graphics that should heighten the experience, while still retaining the series' trademark attention to detail and realism. There's plenty of anticipation building for the next-generation consoles such as the Xbox 360, and it looks like Ubisoft is already pushing the new hardware to deliver a truly groundbreaking experience that lives up to the promise. Set on the streets of Mexico City in 2012, Tom Clancy's Ghost Recon: Advanced Warfighter features a realistic plotline with a believable threats that create a gripping military game full of action and suspense. As the game begins, the governments of Mexico, Canada and the US have signed a treaty calling for a common defense of the three North American nations. The North American Joint Security Agreement calls for all three countries to share in the policing of their common border. In addition to this treaty, the United States has symbolically sold the Mexican government a large cache of weapons and equipment. Not surprisingly, this has led to some pretty strong opposition, especially from military quarters who fear the concentration of power in civilian hands. At a ceremony signing the treaty, the three heads of state are attacked. The only force capable of dealing with this attack are the Ghosts, an elite group of soldiers who've been assigned the security task. These elite US Special Forces then meet up with the Secret Service agents protecting the US President in order to keep him safe. The ghosts keep the Mexican President safe, but the American President has been taken captive by a group of rebels It's up to the Ghosts to safely extract the president, track down the renegade Mexican generals and soldiers who masterminded the attack. 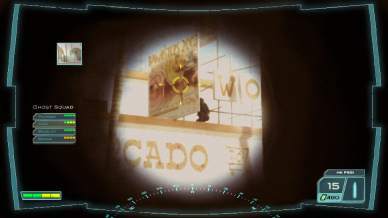 Their well-armed soldiers will battle the Ghosts relentlessly in the streets of Mexico City. While many FPS titles to date have focused on the same set of wars and conflicts in familiar settings, the choice of using Mexico City as a backdrop is a refreshing change of pace from the normal scenarios and should make Ghost Recon 3 even more engaging. 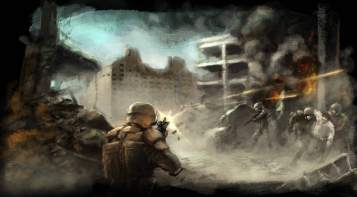 As they enter this urban battlefield, the Ghosts are outnumbered and outgunned on the streets, their superior training and high-tech weaponry will level the playing field, allowing them to see a much greater portion of the action than previously, while reducing their exposure to enemy fire. Ghost Recon 3 will feature 12 Campaign missions, which will each have up to 6 supplemental mini- missions with sub-objectives to complete. Players can choose to play these solo or against another player online. These missions will also solo and co-op maps. Once on the ground, players will find some interesting changes from past games. The developers are promising to include high-tech weaponry and gadgets in the team's arsenal. Players will be able to fully equip their squad with weapons that accurately predict the shape and feel of warfare in the next decade. 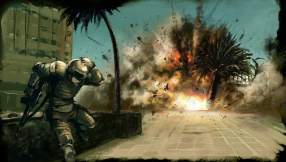 The gameplay itself will stay true to form, with a strong emphasis on tactical strategy in each mission, though with a slight increase in the action element to make the gameplay even more immersive. Players will now have the ability to gain intelligence from unmanned drones that they can control. In addition, your team can now call in Apache helicopters for targeted air strikes which will allow you to take out enemy positions from a safe distance while your team moves into position. In addition to these enhancements, the biggest addition is what's called a Cross Com system. This advanced communications interface is integrated into your HUD and allows you to receive information, news and interact with other soldiers directly during a mission. This satellite controlled system is active on the battlefield an each soldier appears in a small window on the left side of the screen. These new features add together to create what is called the Integrated Warfighter System. In addition to streamlining to communications interface, this should help players by offering a better situational awareness, where they can see the battlefield at near-, mid- and, far- range. The IWS will increase the game's immersion and realism exponentially, allowing commanders a greater flexibility when ordering their comrades around. Besides these impressive new feature, the basic gameplay mechanics have also undergone a slight tweaking, with a better storyline that will allow players to jump right into the game and familiarize themselves without having to go through many tedious training levels first. The single player experience is set to offer about 20 hours of gameplay, though the online modes should extend the game's replay value significantly. 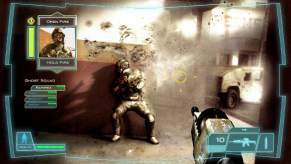 Ghost Recon: Advanced Warfighter is scheduled to appear on the current consoles, including the PS2, Xbox and Gamecube, the real excitement lies in the series' first appearance on next generation hardware. While the game's engine already represents an impressive leap forward, the next-gen version will feature an increased level of realism and a forward looking presentation that will push the series forward significantly in terms of aesthetics and production values. Ghost Recon 3 is set to push the envelope of player's expectations with incredibly detailed textures that allow players to fully immerse themselves in their environments. The game will also feature intense lighting and particle effects to add to its realism, multi-windowing which should bring the IWS system to life and state-of-the-art physics which should make the experience even more authentic and intense. In order to take full advantage of the new consoles' technological abilities, Advanced Warfighter will run on Ubisoft's proprietary Yeti engine, which will allow for more expansive and detailed environments, improved character models and intense realism. While Ghost Recon is looking most impressive on the Xbox 360, Ubisoft is promising to use the best engines on current generation consoles to fully optimize the game's engines. Despite the differing level of visual detail on each platform, all of the console versions will share the same basic plot and storyline. However, Ubisoft is changing the balance on the PC version to slightly to place a greater emphasis on the tactical and strategic elements of the game, which should bring it closer to the original title's feel and appeal more to the PC audience. Ubisoft's consistent track record with their outstanding military titles has been sterling throughout the run of current consoles, and as the transition to the next wave of systems commences, it looks like the company's developers will remain at the forefront by creating groundbreaking titles that truly take advantage of the technological leap forward these new platforms represent. The release of Tom Clancy's Ghost Recon Advanced Warfighter this fall looks to bring the best-selling franchise to the next level with the visual excellence, authentic gear and addictive gameplay players have come to expect from the series.